Ellis Lake Resort is known for its cute, cozy, authentic log cabin lodging built in 1939, which are all non-smoking units. No TVs except for the Chalet and Willow. All of the log cabins have fully-equipped kitchens as well as bathrooms with showers. We also supply linens and towels. Our Log rooms are like a basic motel room with private entrance, bathroom, small refrigerator & coffee maker. 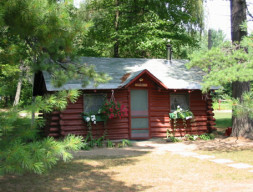 Some of the cabins feature Franklin wood stoves, and each has a private outdoor yard area with picnic table, chairs, charcoal grill, and campfire pit.